hi, mostly nice people of TMK. again. seeing that mario party 7 is going to be released, and that they're never going to stop, I thought it would be a good idea to resend something from months- nay, YEARS past. Question: What's with all the Mario Party sequels? The same concept over and over with improvements is kinda getting annoying. Lizard Dude: Blame the Madden football series. They started it, and proved that people would keep buying. And I guess there's your problem. If people keep buying, they'll keep getting made. David Dayton: I have no problem with the Mario Party series -- every game is filled with new minigames and boards. It's a new game every time, unlike the Madden series. MEGAß¥TE: I wouldn't have any problem with a series like this if they were made part of a budget line, so all you'd actually expect is "the same concept over and over with improvements." They're not really wasting resources since Hudson develops them, but it does have the effect of diluting the Mario brand. If you really want Nintendo to make better Mario games, why don't you just ask 'em instead of complaining about it all the time? David Dayton: There's a small problem with this idea... first, we don't have NCL contacts. Second, I don't think many of the TMK folks are all that grumpy with the Mario game output. MEGAß¥TE: Who are the complainers you are addressing? Lizard Dude: No one ever tries to make a bad game. So you see? The only satisfaction get out of DKJB is knowing that the game bombed in America, (39,000 copies. Yep, some "Triumphant return of Donkey Kong" there, you moronic game designers) and mostly every where else. Seriously through, you know something's wrong with a franchise when Mario Tennis, Mario Golf, Mario Kart Mario Soccer, Mario Baseball (Dixie Kong. Woot.) are more respectful to the DK franchise than a game from the franchise itself. And was DKJB really better than Rare's DKC David? Really? Ruh-ruh-REALLY? Nothing to do with the fact that Nintendo EAD made it this time? Nothing to with that time when you were one of several fanboys who flamed some DKC fan on Gaming Age forums (famous for bashing games for no apparant reason what-so-ever), saying that DKC characters have no right to exist? So, what about those bongos, er? I'm sorry if I've offended some or all of you with this, but this was something I really had to get off my chest. And if DKJB and Donkey Konga count as part of the Mario univerese on your website, than for the love of god, do the same with the Country games. Either that, or take down the DKJB and DKa pages. It seems really odd to have Donkey Kong Country listed as a cameo game, but Jungle Beat and Konga as TMK game. Other than this entire DK problem, I think your site rocks, especially the Lost Bytes section. MEGAß¥TE: Who cares if certain characters are not in a non-story based game? You beat freaking drums, a new gameplay mechanic and you want a silly story to go with it? It's a game: play it, enjoy it. You are in the minority when it comes to not appreciating DKJB, and it's really sad that you'd actually be happy that the game bombed. It's not anyone's fault but your own that you paid full price just because you're a big DK fan. Also, anything David says elsewhere is not affiliated with TMK and does not necessarily reflect the general opinion of the staff. We planned on making the DKC games full games on our list, but we're currently reorganizing our entire list into a database format, so it wasn't a big priority to start editing a bunch of pages to make a few people happy. In the Japanese version, in Kat and Ana's introduction, when the bird drops Ana's letter, Kat says "You've got mail!" In the American release, she says no such thing. I'd guess that it was removed because of AOL's owning the phrase. But isn't it copyrighted (copy...written?) in Japan, too? The first attached sound file is of the Japanese version, and the second one... isn't. MEGAß¥TE: NOA probably just didn't want to take any chances, even though parody should be protected under copyright law. Interesting find, in any case! I was looking up random stuff on google, and chatting it up to my friends one sunday night, until I found, while searching, Super Mario Brothers on Ice! And I was just wondering if you knew about this....yeah. The costumes looked pretty lame in my opinion....but that was the 80s Mario stuff for you. David Dayton: Yep, I've seen that. Quite odd, especially the decision to use a Mae West-styled voice for the princess. Recently I went to A-Kon 16 in Dallas, Texas, where a bunch of VG/Anime fans gather to spend money on crap they don't need. I myself bought a Super Mario Sunshine Mario Plush (pretty big one at that), 3 Famicom towels, about 3 sets of the Dot Matrix Mario Series, and the remainder of the Mario Party Anniversary Plush Collection (I only need Bowser and it will be COMPLETE!). I'm sure you know what I'm talking about, if not, I'll send pics of all the stuff I bought. I also went dressed as my hero, Super Mario. 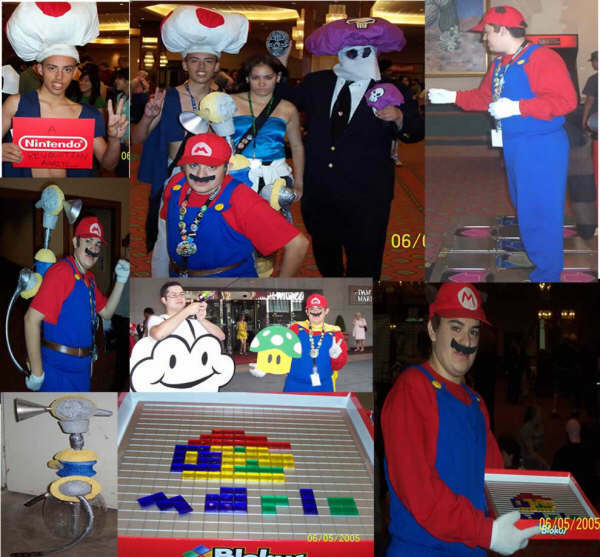 Attached is a picture of all the Mario's I was during the weekend. It was a 3 day event, and I was Fludd Mario, Super Mario (Cape), and Tanooki Mario (Not the Suit, mind you, just the 'Leaf' one). I 'built' the image of pixel mario out of a set of some game called "Blockus". I also ran into a good amount of Mario fans that were dressed as crappy marios, luigis, warios, and the such, but I saw two that i enjoyed, which are in the picture(s). Also pictured is my friend as Toad, and my Girlfriend as Jill Valentine (I know, non-Mario related, but it was a group picture). Ok, i know I'm saying a lot, but I've got one more interesting thing I gotta share just for the sake of sharing. Ever notice that on the box of the SMB 2 USA it has Mario with red overalls, yet in the game he has blue ones? I just realized this last night when reading one of your updates...I know, I'm ashamed I didn't notice sooner. David Dayton: What we should do is make some sort of "TMK" badge thing, and get all these cosplayers to wear it at their meets...or not. Deezer: Hahaha, Lakitu, no way. Chupperson: I agree, that Poison Mushroom guy is awesome. Lizard Dude: I thought the Poison Mushroom was White Spy from Mad Magazine at first. Heyaz! WK here just to ask you who you are. Ok, well, actually I have a few questions, (just like everyone else) and some comments. 1. On Volume #189 of Nintendo Power there is a question in Pulse asking what Mario is holding when he does that "Blow thing" (Cant remember what its called) With Flurry. What do you think It is? Its really starting to creep me out, at first I thought it was her ghostly tail, but thats behind them! 2. What was the first game Kat and Anna and the rest of the WW crew appeared in? Was it just Wario Ware Inc.? 3. Can I have a Pic of a sideways Deezer and a pic of a sideways Mushroom boy, I want to make a picture of Deezer feedin him bread. 4. Exactly what is Mario Kart: GP Legend? What system will it be for? 5. You should start a concept art area of the site, Here are some funny ones for the DS. David Dayton: 1. Perhaps her arm? Her back? 2. Wario Ware, Inc. was the first game to feature the Wario Ware characters. 4. I believe that's the arcade game, developed by Namco. It will be released in arcades... although there are rumors of a GameCube port. 5. Concept art for Mario games would fit TMK, but I'm not sure why we'd have concept art for systems. MEGAß¥TE: 5. Even if we were to post concept art, we wouldn't post anything that you sent because that was fan-made art... concept art would have to be made by Nintendo... there isn't much of that out there. Deezer: 1. A purple glob. Seriously. I don't think it was meant to be anything in particular. Lizard Dude: 1. It always looked to me like one of those Russian-type hand warmers. 2. Mona Pizza's got nothing on us. 3. Step 1: Save Deezer pic and Mushroom Boy pic to your computer. Step 2: Rotate pics 90 degrees. 4. It has Pac-Man characters and takes a picture of your face! Greetings once more, venerable answerers of the mailbag. MEGAß¥TE: There are so few female gamers because until the last few years video games were, as near as I can tell, marketed mainly towards young male species. J.J.: I happen to be amused to find out the answers to the questions I ask. One could very well ask you why you rant and are rude every time you see an email you don't like. It's of no benefit to you, and has no positive efect upon the sender of said email. In short, congratulations. You are now, not that you care of course, the second least respected person in Canada, ranking just above Toobis. Even shorter. Anger management. Now. Lizard Dude: Uh... (I got nothin'... but I already said his name! I gota think of something... AHA!) Ninja. Thousands of them. Chupperson: No, there really is an 'E' in the middle of my last name. The misspelled 'change' is just due to my horrible typing. Sapphira: Excelent pummeling job there on J.J. And yes, nostalgia is always good. Deezer: Ah, I see. This is very interesting information that I shall be sure to hold onto until a point in the future when I will surely need it. And now, just to annoy J.J. some more, even more questions! I. If Bowser, Wario, and other villians from Mario games were to all team up and form the Big Bad Conglomerate O' Evil! (TM), would mario be able to defeat them without having to form his own team? If not, who would he enlist for this team? II. If a Toad eats a Super Mushroom, is it considered cannibalism? III. Is it possible that Mushroom Technology is so advanced that Baby Mario is, in fact, a clone of Mario created to take over for him once he becomes old and useless? In fact, could they have been doing this for a long time, and thus there have actually been not one, but many Marios? IV. Do you think Mario eats Fire flowers to gain the ability to formm and throw fireballs, or does he hold the flower and shoot the balls out of it? V. Do you think it at all likely that a true sequel to Super Mario RPG will ever happen? Is it actually possible? VI. Why was it that, up until the arrival of Mario and Luigi, the Princess was the only human in the entire Mushroom Kingdom? VII. Do you believe a sequel the the movie be a hit, a flop, or just rank somewhere in the middle? VIII. Why does Mario never use his plumbing skills during his adventures? ii. No, as the Mushroom People are not made of fungus. They merely resemble it. iv. I'm fairly sure he doesn't eat them. Nintendo has shown him both using fireflowers to produce fire (SMB artwork, SSBM) and receiving the magical ability to produce the fireballs after touching a fire flower... so I suppose it's up for interpretation. v. We've had three sequels to that game so far. What more do you want? viii. He did use those abilities, in one of the sequels to Super Mario RPG. Heheh. MEGAß¥TE: Thanks for answering my rhetorical question! III. Let's just see how Mario & Luigi 2 turns out. VI. There were others if you consider comics, etc. VII. The problem with the original movie was that SMB fans didn't like it because it wasn't true to SMB. Non-SMB fans didn't like it because they didn't understand what was going on because they assumed it must have something to do with these mysterious "video games." Personally, I thought it was a very good PG movie if you don't try to directly compare it to SMB. There are all sorts of SMB references that you can have fun with. It wasn't as much of a flop as people think though, it did get 2.5/4 stars. While they did leave it open for a sequel, it's probably too late to actually make one. VIII. Do you know what he has to go through when traveling through all those warp pipes? Lizard Dude: Aw, why not Ninji? Sapphira: Why thank you. ^_^; And Ninjis > Ninjas, that is all. I. Uhh...all the good characters? II. Toads are not mushrooms, but mushroom people. So anyway, no. IV. He doesn't eat them. It seems something within the flower enables the power to harness fire when touched or held or something, but other Fire Flowers seem to shoot fire themselves. Different varieties, I say. VI. Who says there weren't? Just because they were the only ones we saw doesn't mean they're the only ones who existed. VIII. Uhh...he does. And another thing I am so sick of is that people believe all plumbers do is fix toilets. Plumbing is "the pipes, fixtures, and other apparatus of a water, gas, or sewage system in a building," and plumbers either build and/or repair these pipes and fixtures. Makes sense to me that they're plumbers. Attached is my response to the last mailbag's request for original remixes. Can you name the tune? My apologies to Mr. Kondo. Deezer: I can name that tune in three notes! Nice job, though I'm not a big fan of MIDI guitar. Hark, TMK. Remember Super Mario RPG? Of course you do. Well, ever since I first played it back in '96(back when I thought that "RPG" was a content rating) I've been a huge fan of Mario RPGs. They're all great, and have retained the same balance of humor and drama that puts me in Mario zen. But I just have one complaint. None, in my opinion, have topped the original so far. Super Mario RPG remains THE best Mario RPG after 10 years(again, in my opinion). There hasn't been a cast like Geno, Mallow, Booster or Smithy since, though Lady Bow came dangerously close to putting Paper Mario on equal footing. I'm still waiting for Bowser to write another haiku, too(arguably the most hilarious moment of the game, if you had already been a Mario fan). So what I'm asking is this: what would you say the chances of Square and Nintendo putting their heads together and creating a Super Mario RPG 2? Even hopefully being able to download SMRPG on the Revolution won't satisfy my hunger for more of that sweet lovechild that can only be spawned when Square and Nintendo get intimate(I don't eat babies). Don't get me wrong, I'm sure Superstar Saga 2 will be one of my favorite DS games yet, but with SMRPG's 10-year-anniversary, I think we dedicated Nintendo fans deserve another dip into that saga. P.S. Doesn't Lady Bow rock? A simple "yes" or "r0xXorzz" will do. MEGAß¥TE: I wonder if Nintendo gets as many SMRPG re-release requests as we do, by volume. Lizard Dude: Kingdom Hearts got two direct sequels. SMRPG should, too. :( Lady Bow, um, r0xXorzz my s0xXorzz.